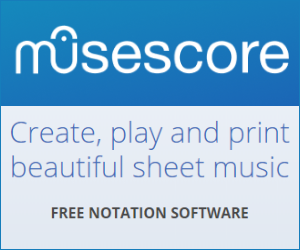 I have a question about a note on a piano sheet (picture below). 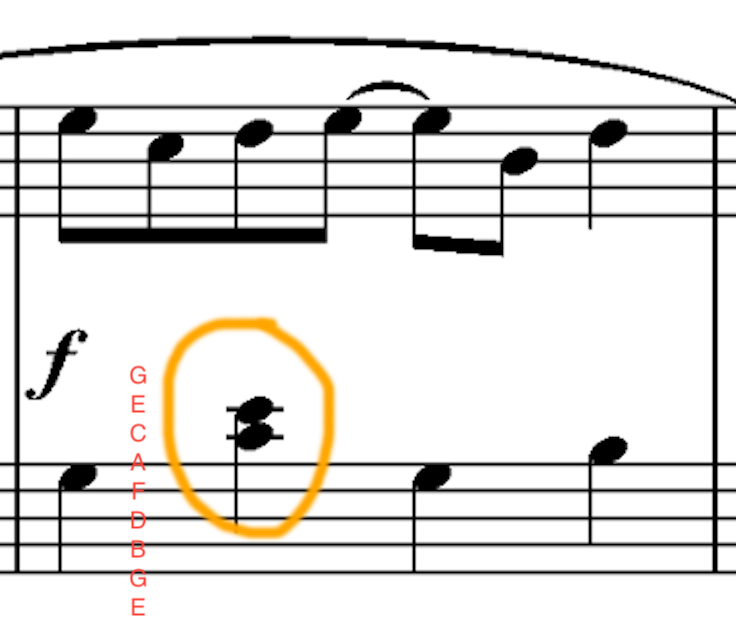 How would I play the note highlighted by the golden circle? I thought only middle C would be marked by a horizontal line crossing it. Would I play this C + D? Is there any reason for the upper note having a horizontal line crossing it as well? This is actually two individual pitches. So in order to play this beat, you need to play both C and E simultaneously. A note with a line through it does not mean "middle C" (which seems to be your original belief); it means "keep going as if the stave extended higher", and the line directly represents this (it's a mini version of the line that would exist across the whole page if the stave did extend higher). That the first such note, when using the bass clef, is middle C, is "co-incidence". With other clefs, it will be a different note (e.g. if you did this in your upper stave, with the treble clef, it would be an A). 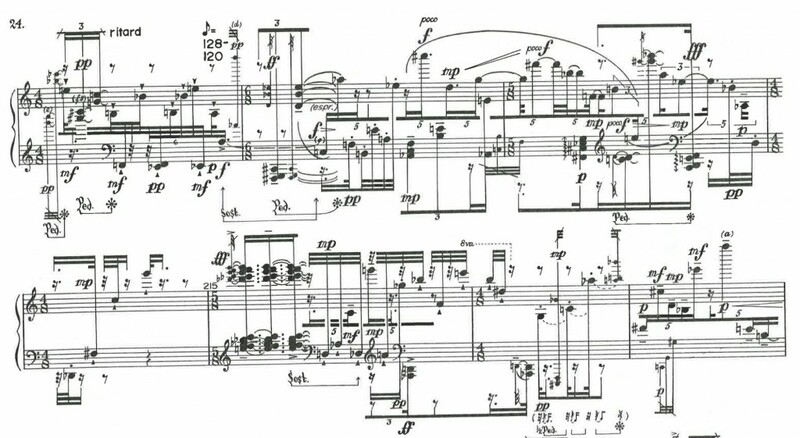 So, per the usual rules of navigating the stave, we can read the topmost note to be two tones above middle C; that is, an E.
Imagine there is only the bass clef there. Middle C is, as usual, shown on its own ledger line. But now, the notes need to go higher than that, still be played by the left hand, so still be written using bass clef. More ledger lines are used above the one for middle C. They are always a third above the last one. So here, the dot on the second ledger line is E. The note in the space above, which would just rest above the E line, is F, and if a G was needed it would have its own third ledger line. That line for the E is actually the same as the bottom line in treble clef, but putting that E dot in the treble clef would mean it gets played with th eright hand - not what the writer wanted. The same phenomenon works the opposite way too. Low notes on the treble clef can have ledger lines of their own. Imagine an A under middle C. That could be written on the second ledger line down - corresponding to the top line of the bass clef. EDIT: When introducing students to the grand clef, I use the idea that once there were eleven lines, but it was too unwieldy, so it was split into two, with middle C given its own floating ledger line. So if one of the staves needed more lines or spaces, it continued with ledger lines in the appropriate direction. Which includes going above the treble and below the bass clef. Makes it easy to understand. The answer is: this is not a double middle C, (in this case both notes would be on the same ledger line). It is a chord of two notes: c4 and e4, (a third). the 3 staves must be thought transparently overlayed accross the 2 others ( C- clef in the middle ) and the notes outside (above or below the respective stave) have to be considered as notes with/on ledger lines. If you search on google „piano sheet“ under pictures you‘ll see this notation is not an special case but the rule.